..::| Velvet Love Box |::.. Forget almost everything you know about live bands. For Velvet Love Box more closely resembles a three-ring circus than a band. 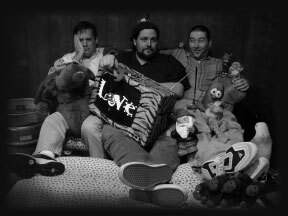 Velvet Love Box, sometimes described as ”acoustic anarchy”, features three veteran musicians from the north Texas area: guitarist/vocalist Scot Cloud, percussionist/vocalist Brandon Bumpas, and vocalist/bassist Neil Schnell. By taking away the screaming amps, the racks of electronic gear, and the same old tired song list; the trio seeks to break from the traditional confines of most bands to forge something new and unique using only the barest of essentials- acoustic guitars, bass, percussion, and a bag of musical tricks big enough to choke Felix. Velvet Love Box formed at Broncos Sports Bar in 1997 as a weekly acoustic jam session. As the weeks passed it soon became clear that a cohesive group had emerged and a phenomenon had been born. The three soon found themselves holding court to throngs of fans, admirers and well wishers. Offers, proposals, and TV movies abounded, but the bright lights of fame and fortune were not the desire of the troupe, and it was decided that the purity of the Box demanded that the music remain for the people. Hollywood would have to wait. In early 2002, to spread the music farther, VLB signed with Texas indie label Aaron Ave. Records. Recognizing their potential, Aaron Ave. immediately put the Love Box to work in the studio. The release of their first EP “Pilot” ushers in a new phase of progression for the band. The disc offers four crowd favorites from their live show, as well as four unreleased original songs. Velvet Love Box now looks to the future. Touring in support of their EP and upcoming LP, adding to their already extensive playlist and continuing their full assault on the “average” band. And so, like musical guerillas, the Love Box carries on. Utilizing the instruments at their disposal to take the music back to the citizenry, bringing their eclectic mix of music and comedy to whatever situation they find themselves in. Wherever there’s a kid who wants something besides Creed, VLB will be there. Wherever there’s a club, a sports event (Dallas Stars, Texas Rangers, etc. ), a corporate party, or a backyard barbeque, the Love Box will be there. And whenever you find yourself in need of that something special, well my friend, Velvet Love Box will be there too. Ever unpredictable, always entertaining, priced to move and named for a TV covered in fur…I give you Velvet Love Box.